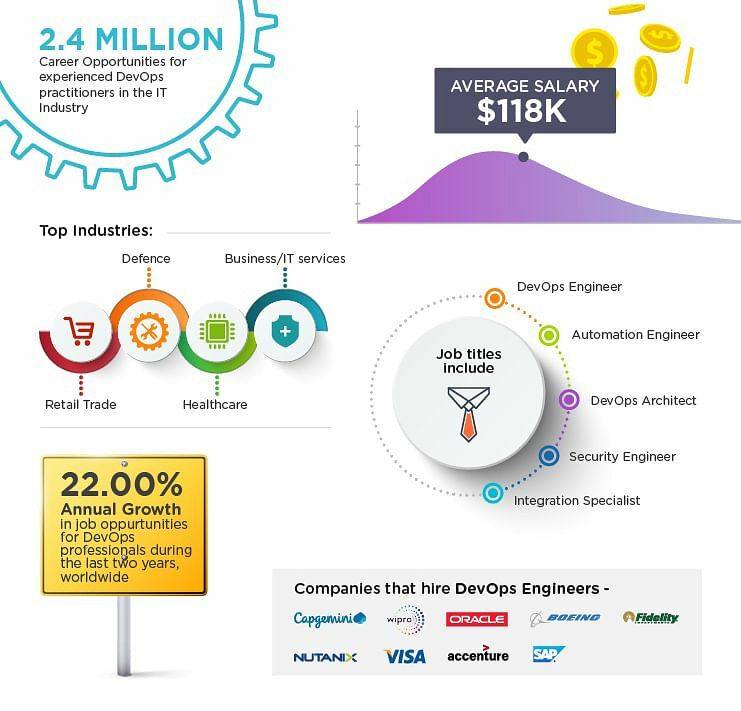 This program will prepare you for a career in DevOps, the fast-growing field that bridges the gap between software developers and operations. You’ll become an expert in the principles of continuous development and deployment, automation of configuration management, inter-team collaboration and IT service agility, using modern DevOps tools such as Git, Docker, Jenkins, Puppet and Nagios. 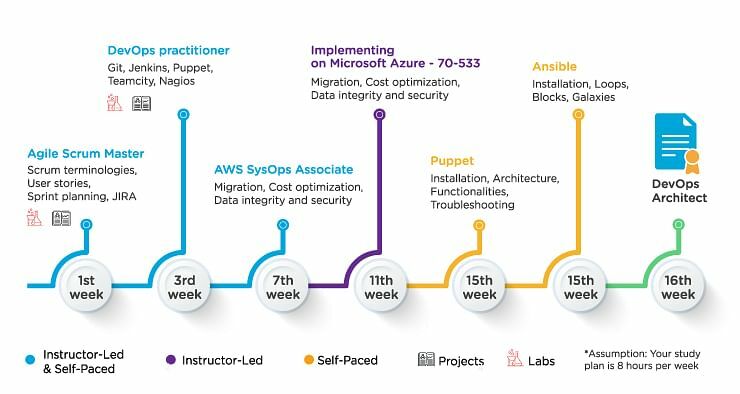 The DevOps Architect Program helps you develop the key skills necessary to become a DevOps Expert. You will master Configuration Management, Continuous Integration and Continuous Deployment, Continuous Delivery, Continuous Monitoring using DevOps tools such as Git, Docker, Chef, Jenkins, Puppet, and Nagios in a practical, hands-on, and interactive approach, and you will enhance your understanding of the fundamentals of Agile and Scrum methodologies. You will also gain knowledge of the two major cloud platforms providers— Amazon Web Services (AWS) and Microsoft Azure. The program is built around a structured learning path recommended by industry experts.You will get access to 120+ live instructor-led online classes conducted by trainers who are experts in the field. You also get access to 90+ hours of high-quality e-Learning, real-life case studies, chapter-end quizzes, simulation exams, and a community moderated by experts. Upon completing the requirements of the learning path successfully, you will be awarded the masters certificate from Simplilearn. Why become a DevOps Architect? A media company wishes to offer a website where users can upload photographs. Captions and titles can be added to the photographs. Thumbnails need to be created from photographs so that multiple images can be displayed on index pages. Customers can order prints of photographs on T-shirts, mugs, and other items. You will need to design, implement, and deploy part of the system. The objective of this project is to design and implement the business and integration tiers of this project. In the final system, image files and thumbnails will be stored in a file system accessible to the web server. The starting point for this project is the code and instructions for exercise 8.7. Take a copy of the DevOps project from lesson 8 and rename the files from Monitoring to Library. You are only required to produce the web front end. The data manager can generate a hard-coded list of CDs rather than extract them from the database. There is a requirement to be able to convert an integer into words. For example, 57 needs to be converted into “fifty-seven”.The objective of this project is to develop a method which can convert the numbers 1 through 999 to words. If you have time to extend the range up to 2 billion. The method needs to be developed using Test Driven Development (TDD). A standalone application is also required which reads a number from the keyboard and prints out its value in words or “Invalid number”. The program should exit when the user enters 0. The application needs to be packaged as an executable jar file using Ant. Clone the repository and install Ant. Run ant to build the project. The build will fail if the unit tests fail. You were asked to put some downloadable materials to Amazon S3 so that your company’s customers all around the world can access them. A month later, during a massive marketing campaign, the marketing team realized that using S3 is expensive and asked you to find and use a more cost-effective way to distribute the files. The Oscrop Corporation’s public-facing web app currently runs on an IIS web server at the company’s chosen ISP. Oscrop wants to migrate this web app to Azure. You must test the web app’s functionality by setting up a test Oscrop web app. An internal team will provide you with a test web app to deploy. You must ensure that they can continue to stage changes to the test web app before deploying those changes to the public-facing site. 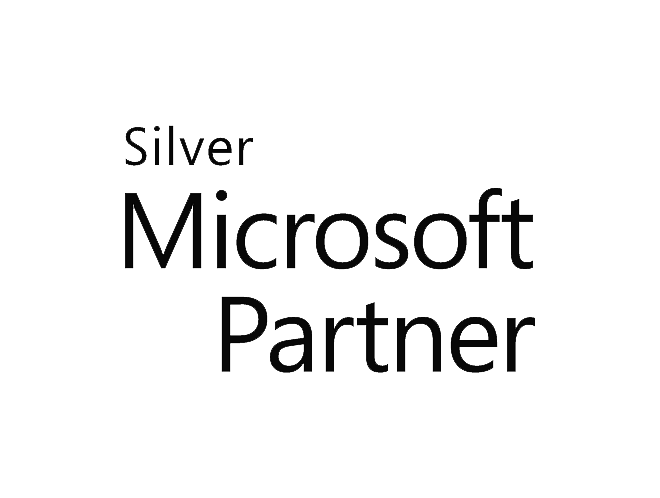 The operations team at Oscrop currently uses a Microsoft SQL Server database to store back-end data for the web app on the company’s servers. You want to investigate the option of using Azure SQL Database to host this database. The operations team is interested in monitoring the performance of this database in Azure. I was looking to get my hands dirty in a few technical areas, particularly inclined towards DevOps. After a lot of online searching, I zeroed in on Simplilearn. I must say the content and the support system is quite good. It took a few days to get the hang of the support system but once things started moving it’s been a smooth process and I am glad to have chosen Simplilearn. I am sure that this course is going to help me upscale my career in the field of DevOps because the course content is outstanding and aligned with job-centric concepts.It’s been a great learning journey with Simplilearn. Cheers! I have enrolled for AWS DevOps Architect at Simplilearn. The course material was self-explanatory. Web-based classes helped in clearing the doubts. This is part of my development plan and will help me in my career. Thanks for offering this course which is simple and content is easy to understand. I have enrolled with AWS DevOps Architect in Simplilearn. The course content was detailed. I am really satisfied with the course. The certification helped to get a promotion in my present company. I would recommend this course to anyone who wanted to get into DevOps. I enrolled in the AWS DevOps Architect Program available at Simplilearn and I couldn't be happier! The online classroom training sessions are meticulously planned and provide in-depth knowledge. All the doubts and subject related queries get resolved on spot and overall a learner will have a great learning experience. There are several options to clear the doubts and plenty of forums on different topics. I would recommend Simplilearn to all professionals looking to boost their careers. Who can become a DevOps Architect? Upon completion of the following minimum requirements, you will be eligible to receive the masters program certificate that will testify to your skills as a DevOps engineer.